One of the main things I tell everybody when it comes to creating composite images is to have a clear concept in mind of what you're trying to achieve and follow it with a plan. Storytelling is the main element of the work I create. To me, it all starts with a story, and it's followed by a sketch. That allows me to have a clear vision of the image I will create, and to approach the tools I will be using in the process. The most critical things you have to keep in mind in the planning process is the direction of light, the angle, and perspective of your images, the emotion you want to convey, and a color palette. I recently did a photo shoot with my kids, and even though I had props galore to choose from, I limited myself to creating a series of different images using just a boat as a prop. I love doing these kinds of projects because they push me to be creative and to find different approaches to shooting one thing. The image I'm featuring in this post today, I had envisioned for quite a bit. I knew exactly in my head how I wanted it to look, so it was easy for me to take the right direction during the photo shoot. I knew my son was going to be standing on the boat, and I wanted my daughter to be under water as a mermaid. For me to pull this off, I knew I needed to get a low angle shot of my son on the boat. This would allow me to create an underwater world in the bottom half of the image. Just imagine — for a shot like this to happen, you would have to be in the water; half of your lens would be above water and the other half under water. The boat would have to be shot from a low perspective. Having all of this in mind, I placed my camera on the floor — on my Platypod Ultra — and took a few frames of my son on the boat. My Platypod has become that tool that I pull out of my camera bag the same way magicians pull out rabbits from their hats. People usually get really impressed by. It's such a small and light tool, but so versatile. So let me guide you a little bit on the process of creating this image. 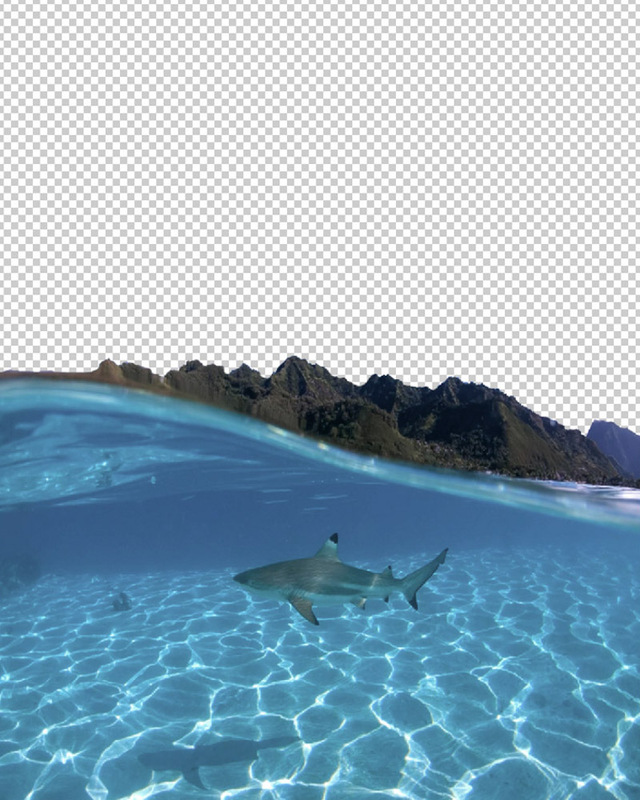 I told you how I wanted half of the image being underwater and the other image above water. I usually build this kind of effect by scratch on Photoshop, but this time, I found a stock image on Adobe stock that matched my concept pretty well. But nothing is perfect; I didn't like the shark on the original picture, and I wasn't pleased with the dull blue sky on the image, so I went ahead and got rid of the sky and the shark, and replaced the sky with another one more pleasant to the eye. I added corals to the bottom right of the image to add to the underwater atmosphere and to create more balance on the picture. I added my beautiful mermaid to the picture, and things got a little complicated for a while with my daughter trying to decide on the colors of her mermaid tail and shells. After numerous changes of color, she then decided she wanted to be Ariel, and who am I to disagree? I went ahead and added the picture of my son on the boat. The image had already so much blue in it; I decided to change the color of my son's shorts to make him stand out a little bit more. Then I added the fishing line, a delicious worm, and bubbles. Then I added a gradient to mimic sunlight, a lens flare and light rays on the water. After adding light, I still thought something was missing, so I went ahead and added a bird. To finish, I added contrast and color graded the image a little bit. My kids and I were so pleased with the result. This is yet another image we created together that we will treasure for years to come.